Have you heard of the Maddalena Islands? They are located right off of the coast of Sardinia, inside the Straits of Bonifacio. 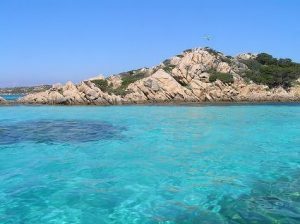 Budelli, Caprera, Razzoli, Santa Maria, Santo Stefano and Spargi are the main islands which surround La Maddalena Island as a group of islands most easily visited by yacht charter. The Maddalena Islands are often compared to the British Virgin Islands, as the Maddalena Islands are close enough to each other to navigate with dead reckoning, and the waters are crystal clear shades of blue, with many private coves and anchorages beckoning for a stop for a cooling swim. You could spend a week in the Maddalena Islands on a yacht charter, just off of the Costa Smeralda cruising between the coast and these idyllic islands. This group of small rocky islands has been inhabited since prehistoric times. Now the main island of Maddalena has the largest settlement. Many of the rest of the islands are inhabited by rabbits, birds, and the occasional Sheppard using the vegetation of these undisturbed islands as a feeding ground for his flock. A main feature of these islands is the pink sand found on many of the island beaches. 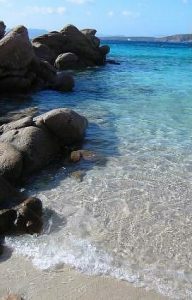 In fact the island of Budelli is home to one of Italy’s most enchanting beaches, famous for its pink sand. Just as popular in ancient times as now, wrecks of Roman ships can still be seen along the bottom and offer a great snorkeling adventure. And these islands are loved not only by the yachtsmen, but also by dolphins, who can often be seen cavorting amongst these islands and coming up to play in the wake of your yacht with a smile and a twinkle in their eye. The Maddalena Islands are a pristine playground that very few are aware of, offering miles of beaches, isolated anchorages and beautiful clear waters. 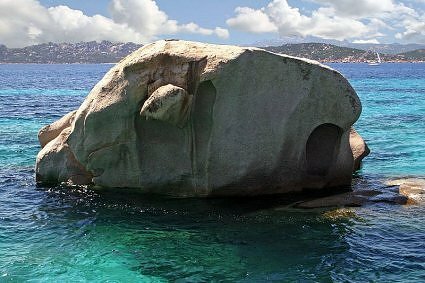 These islands are a highlight of any yacht charter in Sardinia.